I’ve taken my time getting this project finished, and then there was the usual trouble catching one of las hermanitas in a picture taking mood while the light was still decent. But! I have finished my Latvian socks, and I rawther adore them. 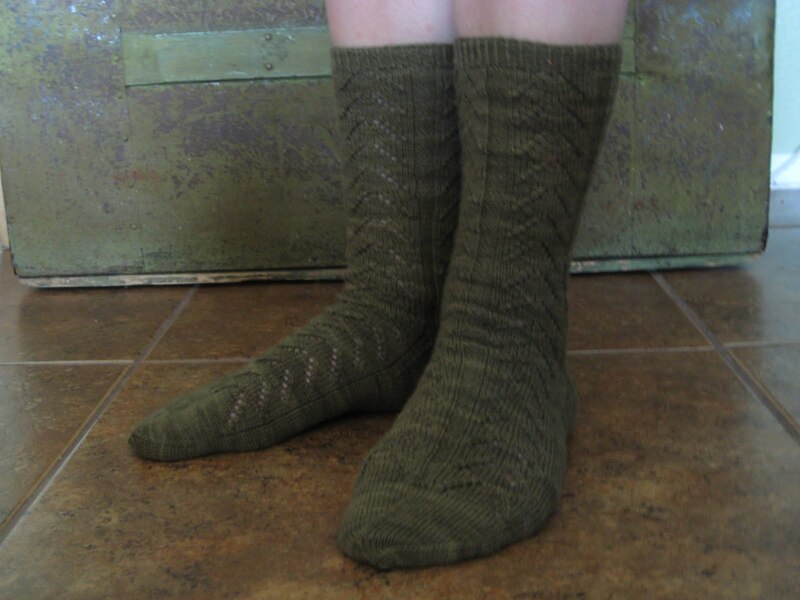 Pattern: Latvian Socks, by the venerable Nancy Bush. Needles: Size 0, which are not so hard to work with once you get the hang of them. I really enjoyed knitting these socks. They took me forever because of the way I worked on it–pick it up, put it down, pick it up, rip out a mistake, put it down–but the pattern is not difficult to read or knit. Bush is brilliant, and all of her patterns are awesome, so the only modification I made was to work on 5 needles instead of 4–this gave me one pattern repeat per needle. These were a perfect travel project: I carried them around everywhere in my purse or backpack, and all the needles survived the ride. However, I did manage to go through all but one of a replacement package of needles either snapping them in my hands (I have a very firm grip, Petunia!) or by leaning over on a seat and snapping them under my elbow. Oops. It’s hard for me to work up a lot of hyperactivity about finishing these socks because I’ve been carrying them around, showing off Sock the First to curious onlookers since February. To everyone who asked me, “So how long will it take you to finish them?”, here’s the answer: Eons when I potter along, finishing other projects in between, less than 3 weeks a sock when I sit my derrière down and just *knit*. But they are really awesome socks, worth all the time I spent on them. Here’s the final mark of a good project: after I finished these socks, I was so sad not to have a pair of socks riding along in my purse with me, I cast on for another pair. A drawer full of handknitted socks? It’s a good thing.